The MEP will address a meeting of the Campaign for Labour Policies group in Dublin today which is likely to hear plenty of criticism of the junior coalition party. 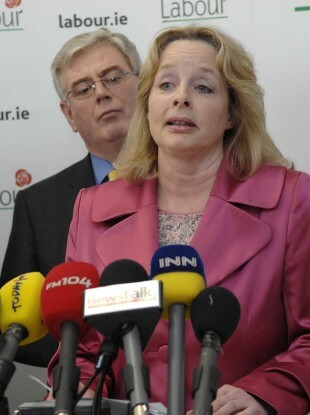 Nessa Childers with Eamon Gilmore in 2009. MEP NESSA CHILDERS has said that she would have resigned from the Labour parliamentary party over the Budget last December had she been in the Dáil. The MEP for Ireland East levelled strongly-worded criticism at the party and its actions in government in a statement announcing her resignation yesterday and she told TheJournal.ie that her resignation is partly about trying to save the party and the people it represents. “This is about the people we have potentially abandoned, the Irish people that are vulnerable, the people we should be representing,” she said. Childers said there is a disconnect between ministers in government and the ordinary rank-and-file members of the party and said that talk of communication between both groups was not the issue. Childers joins one senator and five TDs including party chairman Colm Keaveney in having left the parliamentary party since it went into government two years ago but she said she did not believe she is a dissident. A number of Childers’ colleagues in the parliamentary party yesterday expressed disappointment with her decision to resign although many were not surprised. One Labour TD described Childers as a “fair-weather friend” of the party. Having resigned Childers will today address a meeting of the Campaign for Labour Policies (CLP) group in the Gresham Hotel in Dublin. CLP was set up last year in response to a belief among some Labour members that the leadership was ignoring its core values and policies in the coalition with Fine Gael. “We very much feel we are reflective of a huge swathe of Labour voters… You can see that in Meath East by-election,” CLP member Paul Dillon told TheJournal.ie this week. He said there needed to be “serious intervention to promote policies that are Labour particularly around taxation and job creation and protecting services”. Hundreds of Labour party members are expected to attend the event although it is not clear if any of the parliamentary party will attend. Patrick Nulty, who lost the Labour whip after the 2011 Budget, will be in attendance. Dublin Mid-West TD Joanna Tuffy said she could not attend because of other commitments but said that she welcomed the establishment of the group as Labour “is a broad church”. Email “'I couldn't have gone on' - Nessa Childers on trying to 'save the Labour party'”. Feedback on “'I couldn't have gone on' - Nessa Childers on trying to 'save the Labour party'”.